Revue philosophique independente des hautes etudes: Hypnotisme, Force Psychique, Theosophie, Kabbale, Gnose, Franc-Maçonnerie, Sciences Occultes. Paris, France. Language: French. Publisher: Georges Carre / Librairie du Merveilleux / Chacornac / Librairie Initiiatique / Paul Ollendorff. Editor: Papus (Dr. Gerard Encausse) and Georges Montiere, with the assistance of F. Ch. Barlet, Stanislas de Guaita, and Julien Lejay. 1/1, October 1888-96/12, September 1912. 96 pp. (varies). 10 francs a year in France, 12 beyond. Indexed. Few advertisements, other than for Papus's own organizations and for books published by Georges Carre. The early volumes are massive productions of c. 300 pages that sold for 3 francs 50 each. Volume numbering changed quarterly while issues, confusingly, were numbered sequentially 1-12 across four volumes. The journal was the brainchild of "Papus" (Dr. Gerard Anaclet Vincent Encausse, 1865-1916), a Spanish-born physician and demon of energy whose lifelong goal it was to systematize and synthesize all branches of the occult, spiritualism and Freemasonry and arrange them and their teachings hierarchically into ever-more elite groups--all under his own control. He was not an original thinker, but must have had charisma and single-mindedness because he managed to entice practically all of the French occultists from the 1890s until the First World War into his schemes--and these occultists were nothing if not enthusiasts for the occult cause: Papus was the "second" in the famous duel between Stanislas de Guaita and Jules Bois over the Abbe Boullan. He published many books (most of them of the Traite elementaire or Traite methodique sort), and founded, revived or joined one occult group after another: the Theosophical Society (which he first tried to control in France and then rejected because of its emphasis on Oriental occultism); the H.B. of L.; L'Ordre Martiniste (1888, and continuing today, with Papus as Grand Master until his death), L'Ordre Kabbalistique de la Rose + Croix (1888, with Stanislas de Guaita, 1861-1897, as first Grand Master, and Saint-Yves d'Alveydre, Oswald Wirth and Josephin Peladan as co-founders); the Order of the Golden Dawn (Magregor Mathers' Temple Ahathoor No 7 in Paris); L'eglise Gnostique of Jules Doinel (in which Papus became a Bishop in 1893); the Swedenborgian Rite and the "Supreme Grand Conseil General des Rites Unifies de la Maçonnerie Ancienne et Primitive pour le Grand Orient de France et ses Dependances" which was intended to unite all occult groups under the spacious umbrella of the innumerable degrees of the Rites of Memphis and Misraim (themselves to become the substratum of the O.T.O., the Ordo Templi Orientis), with Papus as ultimate superior for France. Paul Vuillaud, who knew many of those involved in the French occult revival, and was familiar with Papus's correspondence, judged him best: "Papus gave the impression of a chief of state who concentrated all of the ministries in himself." Typescript, published now as Histoires et Portraits de Rose-Croix (Milan: Arche, 1987). Papus and his friend Lucien Chamuel ("Mauchel," d. 1936) founded the Librairie du Merveilleux and its journal, L'Initiation, in 1888--at the precise point when Papus had effectively destroyed Le Lotus, the Theosophical journal begun by Gaboriau and H.P. Blavatsky, and was prepared to channel his energies into occultism pure and simple. In the issues of L'Initiation for April and May 1889, the editors made it clear that the "initiation" intended by the title of the journal meant a "beginning" (from the Latin "initium") and was intended to convey only that its adherents were beginners in or students of the occult--an understanding that galled H.P. Blavatsky at the time and must later have amused those like Rene Guenon and the later French occultists for whom "initiation" meant a metaphysical change of state that occurred upon entry into a traditional "way." In typical "methodical" fashion, the journal was divided from the beginning into a "partie initiatique," a "partie philosophique et scientifique," and a "partie litteraire" and functioned as the clearinghouse and calendar of events for all of Papus's organizations. Its tone, as might be expected from the place and time, was decidedly anticlerical, "republican," secular and mildly socialist. The editorial control was lodged formally in committees governing each "partie." All of the leading lights of the French 1890s up to the First World War participated and published in the journal: Alexandre Saint-Yves d'Alveydre (1842-1909), Abel Haatan, Albert Faucheux ("F. Ch. Barlet"), Albert Journet ("Alber Jhouney," 1863-1923), Albert Poisson, Augustin Chaboseau, Carl du Prel, Catulle Mendes, Charles Detre (Teder), "Ely Star" (Eugene Jacob, 1847-1942), Emile Goudeau, Emile Gary, Emmanuel Lalande ("Marc Haven," 1868-1926), Eugene Nus, Leonce-Eugene Fabre des Essarts, George Delanne, George Montiere, Georges Polti, Henri de Rochas, Josephin Peladan (1858-1918), Jules de Marthold, Jules Doinel, Jules Lermina, Julien Lejay, Juliette Adam, Abbe Paul Roca, Lucien Chamuel ("Mauchel," d. 1936), "Matgioi" (Leon Pourville), Edouard Blitz, Jules Giraud ("Numa Pandorac"), Paul Adam, Yvon Le Loup ("Paul Sedir "), Rene Caillie, emilie de Morsier, Rodolphe Darzens, Rouxel, Stanislas de Guaita (1861-1897), Victor Blanchard, Villier de l'Isle-Adam, Rene Guenon, and many others of the time. What the journal made up for in breadth, however, it lost in seriousness and, despite its pretensions, it became a sort of omnium gatherum of miscellaneous occult observations. The journal was replaced by Mysteria in 1913, and that in turn was replaced (after a hiatus from 1914-1952) by another L'Initiation, which claimed descent from L’Initiation (1888) and its successor, Mysteria, and is sometimes called “new series.” It was edited by Philippe Encausse (1906-1984), the son of Papus (Gérard Encausse), as the organ of his Martinist Order. 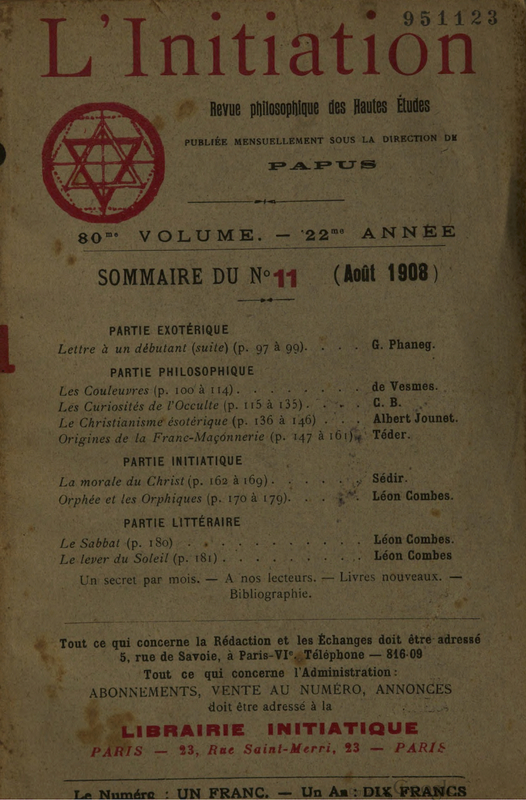 Contributions by a great number of the scholarly occultists of the post-war period, including Robert Amadou, Robert Ambelain, Serge Hutin, Robert Toquet, et al., and selections from all of the important lights of the original journal, together with historical and biographical articles and notes on them. The journal had a special interest in Saint-Yves d’Alveydre and his work and in the tangled history of the Martinists in the twentieth century. A "third series" began with July-September 1976, and the journal continued until 2012. A successor, L’Initiation traditionnelle, is currently published online. Initiation 1908 V80 N12 Sep.